By now, you should understand the basics of arithmetic. Are you done with math? Never. The fun is just beginning for you and the world of math and numbers. While addition, subtraction, multiplication, and division go a long way, there are a variety of different uses for those functions. We're going to cover the next steps of math and show you different types of numbers and objects that can be used with arithmetic. Fractions are all about working with parts of numbers. 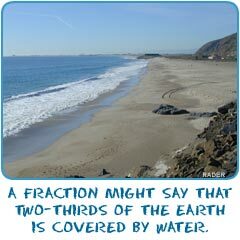 You have probably heard of a half (1/2) or a quarter (1/4), but fractions can be so much more. You can have eight hundred and thirty-three nine hundred sixteenths (833/916) or any combination of numbers. Fractions break a whole number down into smaller pieces. They are most often used in measurements. An inch is often broken down into sixteenths. We'll have you understanding fractions and then adding, subtracting, multiplying and dividing them. Decimals and percentages are another way to work with numbers that are less than one. A decimal breaks down a whole number into parts of ten. You might have tenths, hundredths, thousandths, or any value of ten. The quick way to recognize a decimal is to look for the decimal point. All of the numbers to the right of the decimal point are parts of a whole number. Why would we talk about percentages here? Percentages are only one step away from decimals. Percentages are decimals that have been multiplied by one hundred. If you see a value such as seventy-nine percent (79%), that value is the same as seventy-nine hundredths (.79). Percentages are usually used with number values between zero and one hundred percent. Zero percent is nothing and one hundred percent is an entire thing. If you read this whole page, you will have read one hundred percent of the page. When you work with money, you are bascially doing a lot of decimal problems. We want you to become familiar with common amounts such as values of .05, .10, .25, and .50. In the United States you will recognize those values as nickels, dimes, quarters, and fifty-cent coins. Don't feel sad. We'll also work with a lot of pennies (.01). Money is probably the most important use of decimals in your day-to-day life. It's never too early to get started.